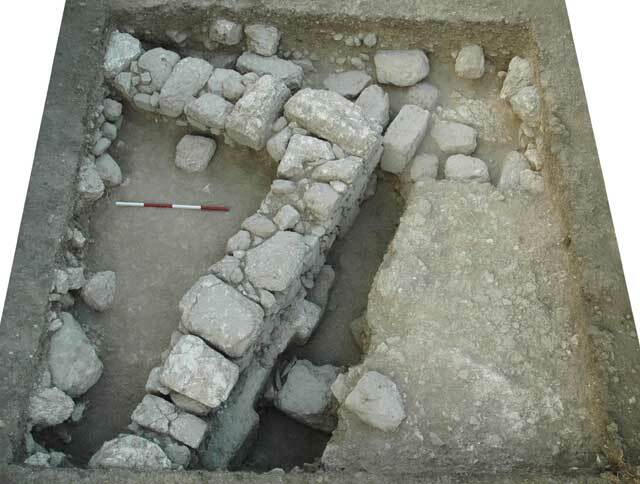 In May and June 2012, an excavation was conducted at Shihin (Asochis; Lisence No. G-27/2012; map ref. 226564/740810). The excavation, on behalf of Samford University, Kentucky Christian University and Kinneret Academic College, was directed by J.R. Strange (Samford University, surveying, architecture, photography), with the assistance of associate directors M. Aviam (Kinneret Academic College and the Institute of Galilean Archaeology) and D. Fiensy (Kentucky Christian University; area supervisor). Also assisted C. Cope (zooarchaeology), J. Keller (glass), Y. Dray (Conservation), J.F. Strange (University of South Florida; senior archaeological consultant, architect), D. Groh (Illinois Wesleyan University; ceramics consultant), B. Cushman (Westminster College; artifact registration), C.M. Strange (Camp Manager), as well as C.T. McCollough (Centre College), C. Groh, R. O’Neill, A. Carr and C.K. Oldfather (area Supervisors) and D. Maayan (artifact photography). The excavation was funded by Samford University; the Fund for Biblical Archaeology; the Miller Center for Contemporary Judaic Studies, the University of Miami; the Appalachian College Association; and by private donations from Dr. and Mrs. J.F. Strange, Mrs. E. Strange and Mr. C. Bertaut, Dr. S. and Mrs. S. Salyers and Dr. R. and Mrs. J. Keller. Surveying equipment was donated by Robins & Morton Construction Company and by Leica Geosystems, USA. 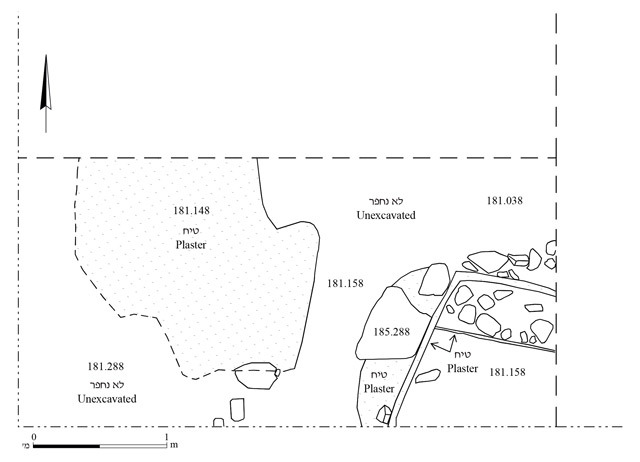 Eight squares (5 × 5 m) and half-squares were opened in two excavation areas on the crown of the northernmost of Shihin’s three hilltops (Field I) and on the next terrace to the north (Field II; Fig. 1); Field II is about 4 m lower in elevation than Field I. The squares in both fields were located along the same, contiguous grid. 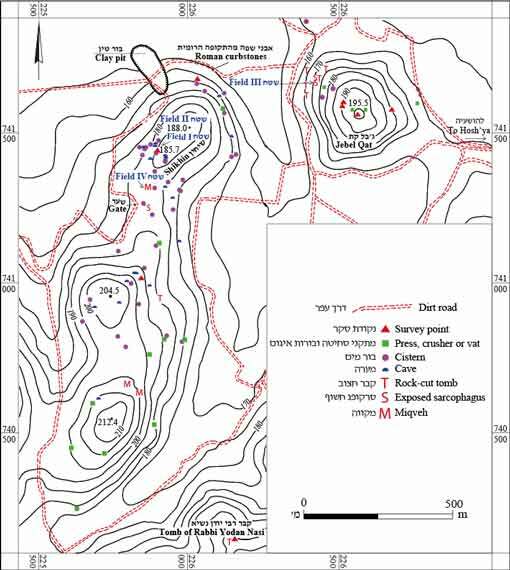 The teams in two surveys conducted at the site, in 1988 (Strange, Groh and Longstaff 1994; 1995) and in 2011 (Strange 2012), identified evidence of pottery manufacturing east of an ancient clay pit, which is still visible on the northwestern slope of the hill (Fig. 1). Four full squares and three half squares were opened (Fig. 2). During a 2011 survey, large architectural fragments were spotted in a terrace wall running northeast–southwest on the crown of Shihin’s northern hill. These included five column drums (estimated diam. 0.7 m), at least one upside down column base (diam. 1.03 m; see below), two carved moldings and two battered fragments of Ionic capitals. We assumed that these architectural elements adorned a large building that occupied the crown of the hill, to the east of the terrace wall. The terrace wall was examined in Sq I.1. Most of the squares opened to its east (I.3–I.7) yielded building remains, but do not seem to have belonged to the building associated with the architectural elements. It is more probable that these structures served in some way in the pottery production at the site. Square I.1. 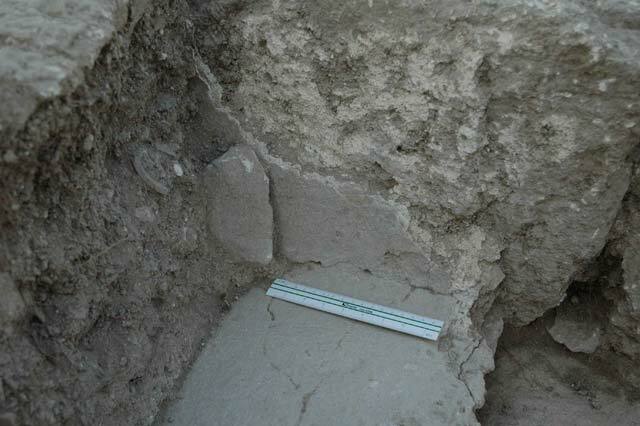 The excavation in this square yielded two of the most prominent column fragments visible in the terrace wall. The excavation reached a depth of several centimeters below an upside-down column base (Fig. 3), which was found lying on dirt. The latest pottery found under the column base was a single late Byzantine sherd. Square I.2. At some time during the Byzantine period, an area in the eastern part of this square was leveled with earth and rough blocks of stone (indicated by dashed lines in Fig. 2) to form a work surface or a platform. This surface was probably associated with the agricultural activity for which the terrace wall was built. Square I.3 (Fig. 4). A bench (W3007) comprising a single course of cut stones in secondary use, one row wide, was set on a layer of soil (thickness 3–5 cm) along and to the northeast of a southeast–northwest vertical face cut into the bedrock (L3999); one stone extended into Sq I.2. The soil excavated between the northern edge of the bedrock and the southern face of the bench yielded four sherds from the Late Roman period and one lamp fragment, possibly of the Northern Stamped type of the third–fourth centuries CE. This evidence provides a tentative relative date for all the contiguous features in Field I. The bench was laid against the inside, northern face of a rock-cut ridge, perhaps the result of quarrying, which served as a wall foundation; the rest of the wall was completely robbed. A narrow threshold (width 0.66 m or 2.2 Roman feet) was hewn in the bedrock ridge. Two sections of a fine-quality plaster floor covered the bedrock in the northeast (L3010) and the northwest (L3012) parts of the square; both sections came up to the northern face of the Bench 3007 (Fig. 5). In the northeastern part of the square, a second plaster floor (L3004) was laid over a layer of cobbles and earth (thickness 0.3 m; Fig. 4), which covered the earlier one. Thus, Floor 3004 was at the same elevation as the top of the bench. A slight upturning at the western edge of the upper floor suggests that it came up to a stone-built wall or bench that ran perpendicular to Bench 3007 and was founded on the lower, earlier floor. The floors’ dates are inconclusive, but, judging by the pottery finds, they seem to have been laid no earlier than the third century CE. Square I.4 (Fig. 6) was quite disturbed. A plaster floor (L4999)—probably a continuation of the lower floor in Sq I.3—abuts the southern face of a wall (W4013) running northwest–southeast. Wall 4013 probably dates from the Late Roman period as well, based on the Late Roman finds uncovered in the soil excavated north of the wall; these were probably covered by a plaster floor that abutted the wall’s northern face. A stone threshold set in the wall (interior width c. 0.8 m or 2.7 Roman feet) consists of two parts that originally belonged to different thresholds. It held a wide, single-leaf door that opened to the south. A fragment of the upper part of a stone lamp mold showing the cutout for the fill hole and part of the shoulder and discus (Fig. 7:A) was found in topsoil near this square. Square I.5 (Fig. 8). A northwest–southeast wall (W5018) is the extension of W4013 in Sq I.4, and a badly damaged plaster floor (L5002) is the continuation of the floor in the northeastern corner of Sq I.4. A section through the fill beneath Floor 5002 (L5011; depth over 1.1 m) yielded pottery production waste, most of which ranged in date from the Early to the Late Roman periods, with some Late Hellenistic-period sherds. Floor 5002 originally reached both the northern face of W5018 and the western face of the upper surviving course of a wall (W5004) that forms with another wall (W5005) a southwestern corner of what is probably a house. The corner walls were founded on bedrock. The material from within the house corner dates from the Late Roman period, probably indicating when the building went out of use. Thus, it seems that this structure went out of use when the structure to its west—with Floor 5002—was built. The stub of a much lower wall was found abutting the western, vertically cut face of the bedrock below W5004. Square I.6 was also badly disturbed by plowing and when an olive tree was burnt down. 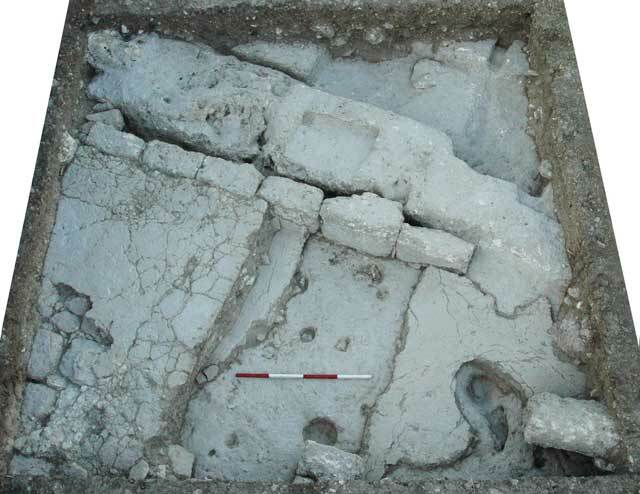 A poorly preserved plaster floor (L6014, L6015) in the southern part of the square was probably the continuation of the floors in Sqs I.4 and I.5. Like Sq I.5, this square, particularly its northeastern part, yielded a large quantity of pottery production waste, though unlike Sq I.5 the pottery was found adjacent to the floor rather than below it. One fragment of the upper part of a potter’s wheel and a fragment from the floor of a pottery kiln’s ware (firing) chamber with inlet flues (diam. c. 2.5 cm) were found in the square, along with what might be additional fragments of the kiln. The square also yielded two fragments of the bottom parts of stone lamp molds, both carved while using a compass (Fig. 7:B, C); one bears two carved rings near the edge of the base, and the other has three. Square I.7. Like Sqs I.3 and I.4, this square yielded a northwest–southeast row of stones (W7003). It was founded on a thin layer of soil that covered the bedrock, which exhibited evidence of rock-cutting. No foundation trench was found, and no excavation was carried out under any of the stones. The soil accumulation on both sides of W7003 (L7999) seems to date from the Late Roman period. One pottery sherd and one silver coin (1/24th of a sheqel), both from the Persian period, were found in the square, suggesting that some sort of presence took place at the top of the hill during this period. A cavity in the bedrock at the southern edge of the square, partially obscured by the southern balk, may be an opening leading into a cistern; if so, the area was an outdoor space or a courtyard that was later covered by a building. Field II is a probe (southern part of Sq II.1; 1 × 2 m; Fig. 9) excavated following the results of a gradiometer survey that detected here a stronger magnetic field compared to the rest of the terrace. The results were inconclusive, as no evidence of burning or pottery waste was found. 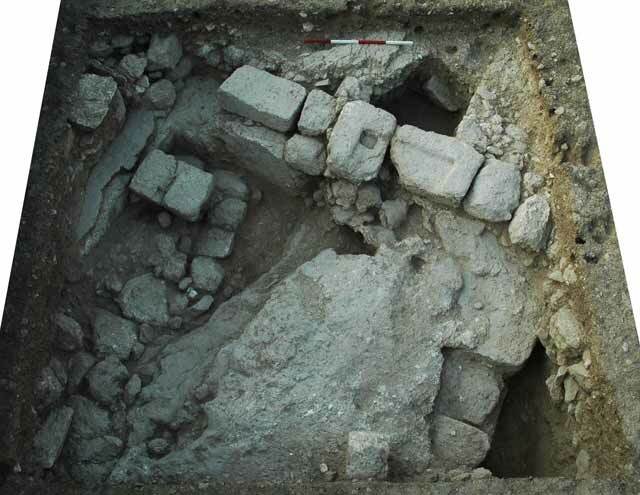 However, part of a plaster floor, similar to the floors found in Field I, and a corner of an installation bearing plaster on its walls were unearthed. The soil covering these remains contained potshers from the Persian period (12 sherds) and the Late Roman period, suggesting that it accumulated during the later period. Pottery production waste emerged in Sqs I.4, I.6 and in Sq I.5, where the volume of pottery waste was impressive. Additional evidence of pottery production came to light in Sq I.6, where fragments of a potter’s wheel and kiln remains were found. The three fragments of lamp molds recovered in the excavation are remarkable, as they probably point to the production of lamps at the site. The majority of pottery from the excavation (57%) dates from the Early Roman period. This probably indicates both a population increase and the beginning of pottery production at the site. The Roman period accounts for 94% of the pottery collected. By contrast, based on initial readings, only three of the 18 recovered coins date from this period, whereas ten (57%) date from the Late Hellenistic period. No coins from the second century CE were recovered, and only one coin could be clearly ascribed to Constantine II. The finds also included three fragments of vessels made of soft chalk, one from Sq II.1 and two from Sq I.4. The three stone vessels confirm the writings of Josephus and rabbinic sources (beginning with the Tosefta) indicating that a Jewish population resided at Shihin. Evidence of the production of pottery vessels and lamps is the most significant result of the season. Although people have been aware of Shihin’s pottery production since the publication of the 1988 survey (Strange, Groh and Longstaff 1994; 1995), lamp production was heretofore unknown at Shihin. Subsequent excavation seasons will allow for petrographic and chemical analyses of the Shihin’s pottery, which will lead to conclusions regarding the distribution of its wares during the Roman period: In addition, we hope to learn in future seasons what types of lamps were produced at Shihin and when they were produced. We may also learn whether they were intended only for local use or also for a wider distribution. Strange, J.R. 2012. Shihin, Survey. HA-ESI 124. 3. Column base: (A) in situ, looking north; (B) section; (C) bottom view. 4. Square I.3, looking south. 5. Square I.3, Floor 3010 abutting Bench 3007, looking southwest. 6. Square I.4, looking north. 8. Square I.5, looking south.